On a hot summer’s day, nothing beats a fresh and light dessert with fruit. 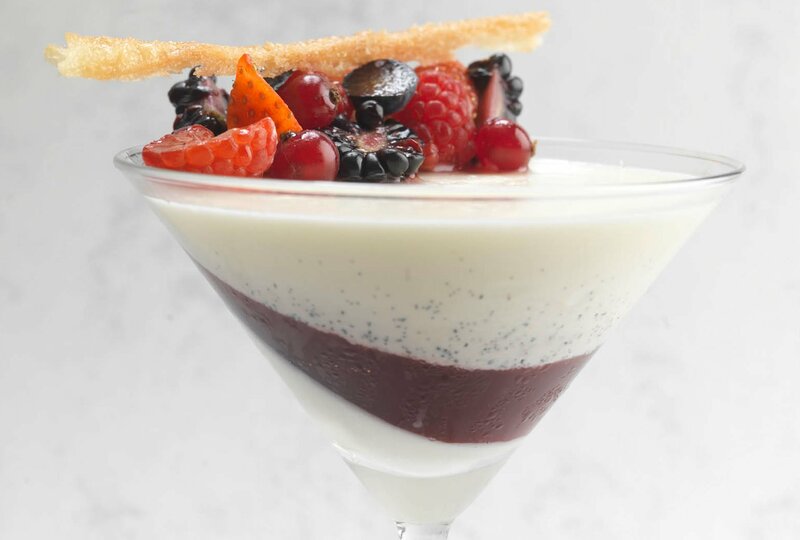 Vanilla cream, blackberry jelly, fresh fruits and a crispy element, this summer recipe, which is not only easy but can also be made in advance, will provide the perfect finale to your dinner! , whisking vanilla bean paste with egg yolks, and stiring sugar into milk. Pour a quarter of the mixture into the bottom of the glasses and refrigerate on an angle until set, about 30 minutes. Bring the blackberry juice to a simmer. Add sugar and stir until dissolved then remove from the heat. Place the gelatin leaf into a bowl of cold water until softened, about 5 minutes. Remove from the water and squeeze to remove excess water. Add into the hot blackberry juice and stir until dissolved. Cool either in the refrigerator or over iced water until cool to touch and just starting to thicken. Remove glasses with set Madagascan vanilla cream from the refrigerator and pour over the blackcurrant jelly. Return to the refrigerator and rest on a similar angle until set, about 15 minutes. When the jelly is set divide the remaining Madagascan vanilla cream between the glasses and return to the refrigerator standing upright for about 30 minutes. Preheat the oven to 180ºC. Cover a baking sheet with Roll out puff pastry on a lightly sugared work surface to a thickness of 2 mm. Brush the 25 with beaten egg white, sprinkle with sugar and cut into thin strips. Transfer on a baking sheet and bake until the pastry is golden brown and crisp to touch, about 5 minutes. Quarter the strawberries, halve the raspberries, blackberries and blueberries. Arrange the fruit to one side of the glass. Finish with the sugar match stick.